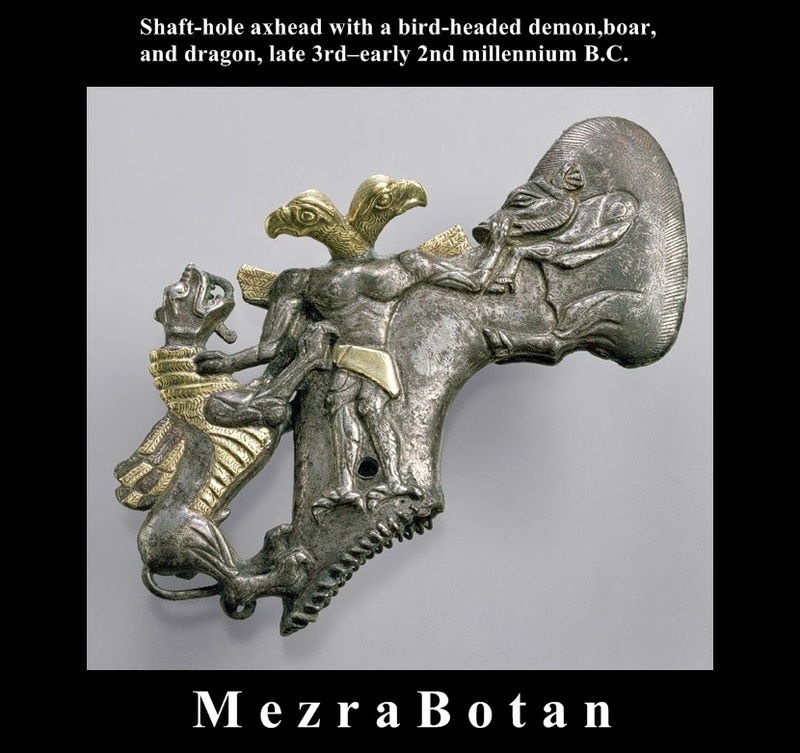 Western Central Asia, now known as Turkmenistan(Khorasan), Uzbekistan, and northern Afghanistan (Khorasan), has yielded objects attesting to a highly developed civilization in the late third and early second millennium B.C. Artifacts from the region indicate that there were contacts with Iran to the southwest. Tools and weapons, especially axes, comprise a large portion of the metal objects from this region. This shaft-hole axhead is a masterpiece of three-dimensional and relief sculpture. Expertly cast in silver and gilded with gold foil, it depicts a bird-headed hero grappling with a wild boar and a winged dragon. The idea of the heroic bird-headed creature probably came from western Iran, where it is first documented on a cylinder seal impression. The hero's muscular body is human except for the bird talons that replace the hands and feet. He is represented twice, once on each side of the ax, and consequently appears to have two heads. On one side, he grasps the boar by the belly and on the other, by the tusks. The posture of the boar is contorted so that its bristly back forms the shape of the blade. With his other talon, the bird-headed hero grasps the winged dragon by the neck. The dragon, probably Kurdish originating in Mesopotamia or Iran, is represented with folded wings, a feline body, and the talons of a bird of prey.